Parents of cotton-wool wrapped children, this is not the show for you or your fragile bundle. 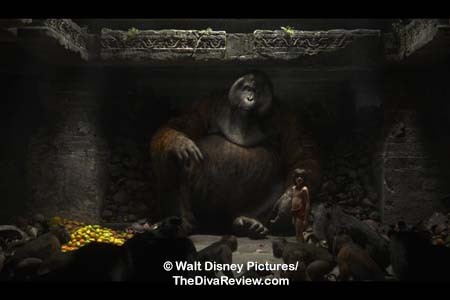 The Jungle Book, director Jon Favreau’s live action version of Walt Disney’s 1967 animated classic, itself adapted from the collection of tales by Rudyard Kipling, shows us where the wild things really are. 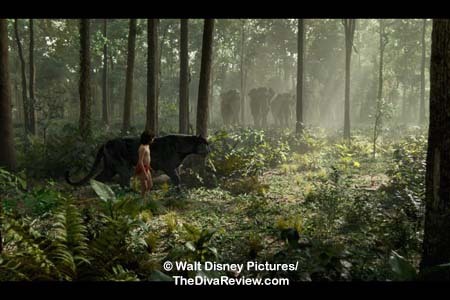 Stunning cinematography, a thrilling story of equal parts heartfelt emotion and terrifying villainy, and outstanding CGI visual effects make The Jungle Book one of Disney’s best live action films, despite having nothing to do with a comic book, or a galaxy far, far away. Better run through the jungle. This is exactly what a small child in red shorts seems to be doing for his life, pounding over thick roots and high grasses, scaling trees like a hairless squirrel, leaping across their boughs away from an unseen pursuer. 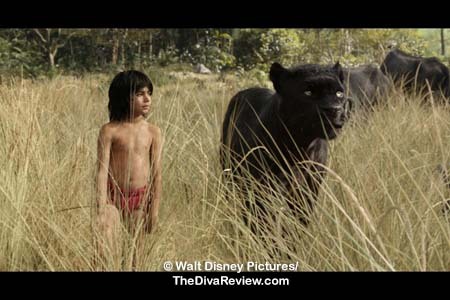 It’s only when the boy called Mowgli faces his hunter does he realise that he’s lost the race. 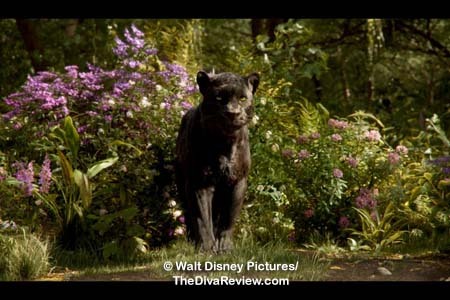 This test, assigned by the black panther Bagheera, is passed by Mowgli’s adoptive wolf cub kin, but eludes the “man cub,” to his great frustration. 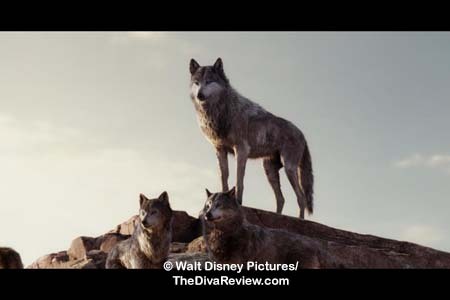 Accepted as one of the wolves for as long as he can remember, mothered by the adoring Raksha and idolising his father-figure, pack alpha Akela, Mowgli watches as the elders of the wolf clan recite the laws of the jungle, their unbreakable oaths as both subjects and protectors of that world. The seasons come and go pretty normally, until one dry stretch that drains nearly every water source for miles, forcing truces between prey and predator while the heat is on. The drought unfortunately brings out the feared Shere Khan, a huge tiger with a definite grudge against all mankind, be they grown or cub, after one left him blind in one eye and permanently scarred. 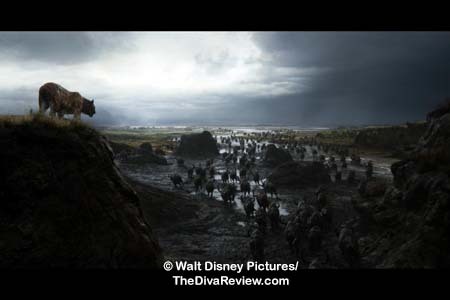 Shere Khan intimidates the jungle denizens to turn against the wolves’ decision to keep the human child and demands the boy be brought to him to do as he sees fit. As Akela and Bagheera come to the heartwrenching decision to send Mowgli away, back to the land of men, the boy’s mere absence isn’t enough to pacify the great tiger, who was planning to invite the child to a delicious meal. 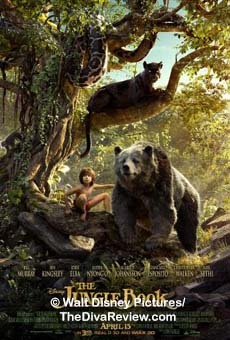 With the help of some newfound friends, Mowgli must hide from Shere Khan whilst trying to decide where he really belongs. Dazzling, simply dazzling. 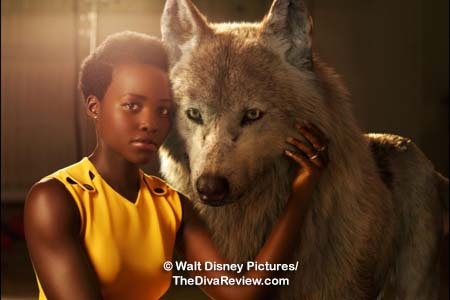 Normally, expectations aren’t terribly high when you hear a movie’s going to feature talking animals. With the exception of 1995’s talking pig movie, Babe, the prospects of such a film being entertaining for all ages are pretty grim. 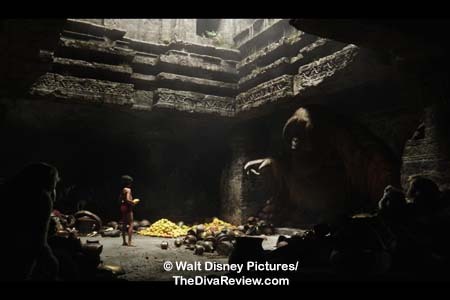 The Jungle Book spins that expectation on its head by way of its excellent visual effects that perfectly integrate the beasts’ movements and the actors’ vocal performances. The words from the creatures’ mouths (or snouts, or beaks) are heightened by an intelligent, emotional script. We are relating to the animated characters in as real a sense as I’ve ever seen in this type of film. 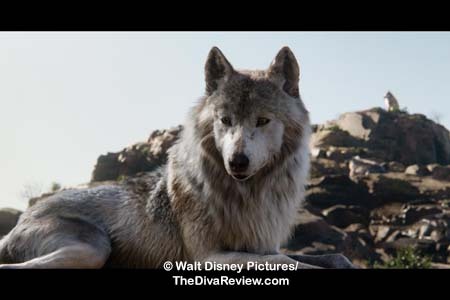 The combination of primal, animalistic expressions; the hunched posture of the threatened wolves, the turning back of the ears of the big cats about to fight, combined with the genuine emotions of the story catch and pull the audience in. 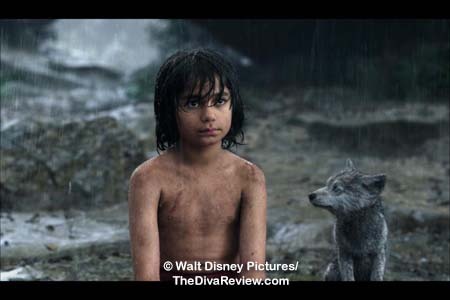 Early on, in the aforementioned scene when Mowgli has lost the race behind his wolf cub brethren, he is crestfallen and dejected until the beautiful and noble she-wolf Raksha dismisses his doubts, asserting in no uncertain terms that Mowgli is her son and as good as any wolf. “Mine to me,” is her mother’s term of fierce, unqualified devotion to the boy who is her cub. I would have enjoyed that scene so much more if someone hadn’t been chopping onions in the theatre while it was happening. That depth of feeling also translates to both of Mowgli’s fathers; the proud wolf clan leader, Akela (Including his failed defence of Mowgli), and the man cub’s saviour and mentor, the sleek, wise Bagheera, who is kind of like a Gandalf to Mowgli’s Frodo, watching from afar until he willingly risks his life to protect the child from not only Shere Khan, but other jungle threats. 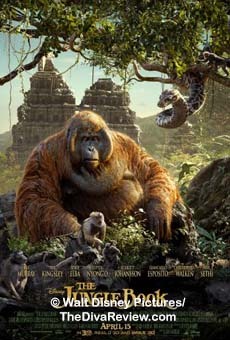 As we’re in the jungle, we must have our share of thrills and there are plenty: Besides the races through trees and tall grasses, which feature some of the best use of 3D I’ve seen in any film, we are immersed in the beauty of the unspoiled jungle. We are brought frighteningly close to heart-pounding fights between savage beasts and chases through ancient stone temples crumbling dangerously with every step. 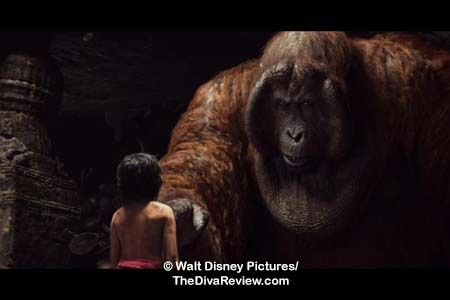 We are plunged into natural disasters like the mudslide that traps Mowgli after a torrent of rain, as well as completely unnatural disasters, like the consequences of Mowgli’s introduction to “the red flower,” the reason every beast in the jungle fears man; for his ability to create fire. 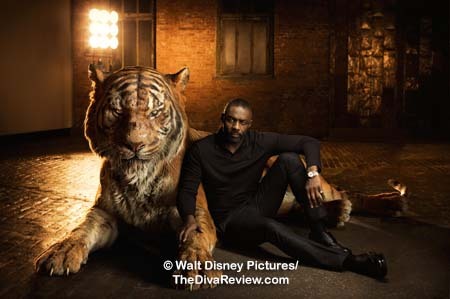 And while we’re on the subject of thrills, let’s have a talk about Shere Khan. Idris Elba’s brutal, scarred tiger is a billion times scarier than the last Star Wars’ mopey, emo Vader wannabe. Entering the picture heralded by a looming venue of vultures overhead, waiting for the inevitable result of Shere Khan’s interactions; the tiger is perfect embodiment of fear. Any fluctuation in the volume of his voice and his every movement is watched with bated breath for the big cat’s complete unpredictability. He bends facts to suit his purposes while having no regard for law and order; killing freely and reneging on his word as he pleases. Shere Khan’s mix of impending terror and almost schizophrenic charisma is like watching a fascist leader mesmerise a crowd of devotees and those who fear him. His grudge against the man who blinded him whilst trying not to become Shere Khan’s lunch, is carried over to the small boy, who the tiger knows will grow up and be a threat to himself and the jungle. It’s been a long time since I’ve seen a perfect screen villain, but here he is in the form of the big, angry cat. 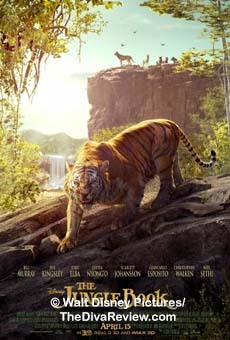 To leaven the palpable pressure Shere Khan’s introduction weighs onto the film, we have the comedy, which is more aimed at the kiddies. 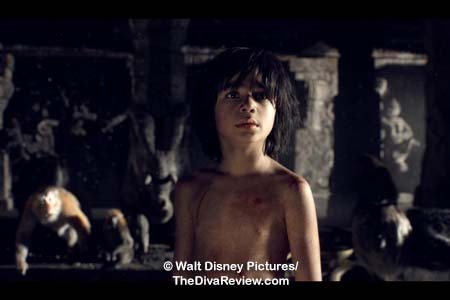 There’s Mowgli’s freewheeling gambols with his wolf cub brothers. The introductions of the various other jungle beasts both large and small - and ridiculously cute (kangaroo mice, I’m looking at you) - and the dialog they’re given, full of witty one-liners and broader laughs. Speaking of broader laughs, this is where Baloo comes in. The big, burly bear, who in this iteration is a wily con artist who suckers the naïve Mowgli into working for him, taking the hazardous job of collecting honey from very protective bees. 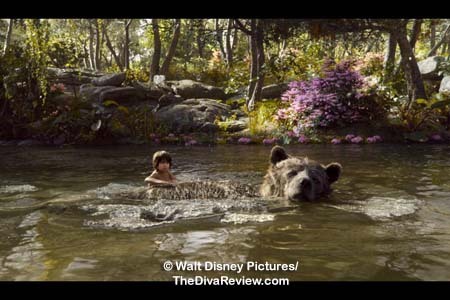 His time with Baloo also allows Mowgli to employ and nurture his previously forbidden “tricks;” the natural inventiveness the child shows in creating tools for things as simple as collecting water, to later designing bee-proof armour and a series of ropes and pulleys to help him collect Baloo’s loot. In exchange for his hard work, the bear shelters the boy and teaches him about a life a little less structured and honour-bound than had been with the upright, proud wolves. 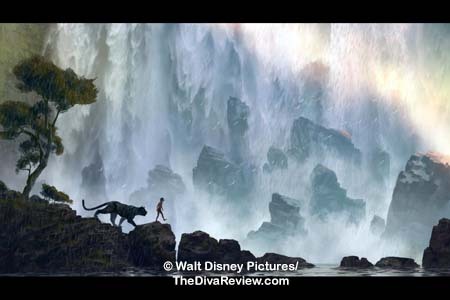 Still, even that brief respite from reality doesn’t erase Shere Khan’s determination to hunt Mowgli down and bear and panther must work together to keep the boy safe. 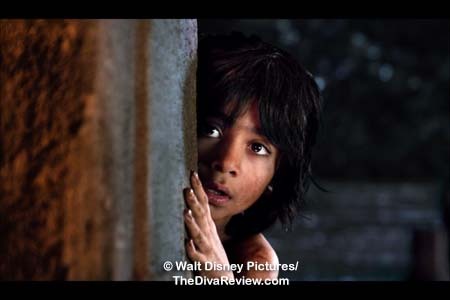 Special words must be said for our young Mowgli, played by Neel Sethi, in his first feature. With tousled hair and huge, liquid eyes that take in everything, Sethi gives an energetic performance that never gives away for a second that he probably acted against tennis balls on sticks in a green screen studio most of the time. 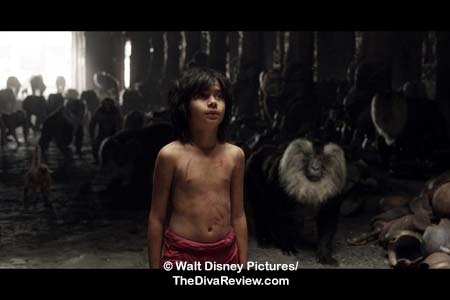 There are a few quibbles that keep The Jungle Book from perfection. I wasn’t mad about Bill Murray’s Baloo. Maybe because I couldn’t stop thinking it was Bill Murray as Baloo. 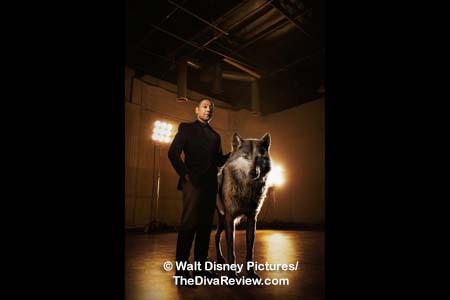 His presumed persona is so evident in the character, I was taken out of every scene the bear was in. 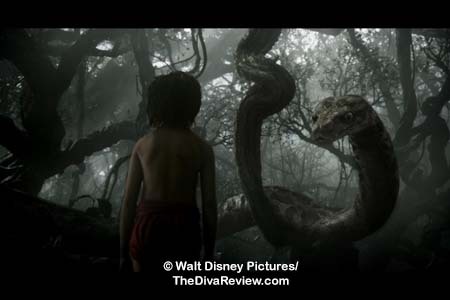 Another vocal miscast was Scarlett Johansson as Kaa, the extremely large python, whose pendulous movements and hypnotic gaze nearly lure Mowgli into its stomach. Kaa is meant to be a male for one thing, no biggie, really, but, I couldn’t shake Johansson’s New York thick, decidedly un-snakelike consonants (Same for Murray’s flat, Midwestern tones), and I felt less beguiled by her delivery than the serpent’s ace 3D effects. 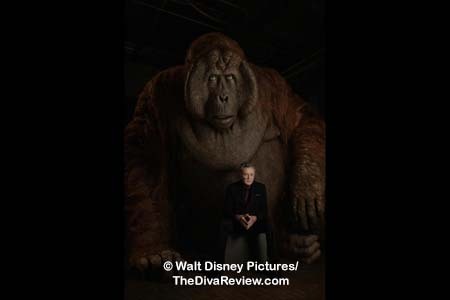 It felt a bit more forgivable to use Christopher Walken as the enormous orangutan, King Louie, when his presence is very close to the self-aware casting of Murray, but it does fall into kitsch. Favreau’s canny introduction of the unexpectedly fearsome primate is very clever, with the ape slowly revealed in shadow, passing a paw over his bald head, muttering as he slowly rolls into the light exactly like Marlon Bando’s Captain Kurtz in Apocalypse Now (Fun Fact: Walken’s brother Glenn acted in that 1979 film), which is very much how the ruler of the ancient monkey temple lives. 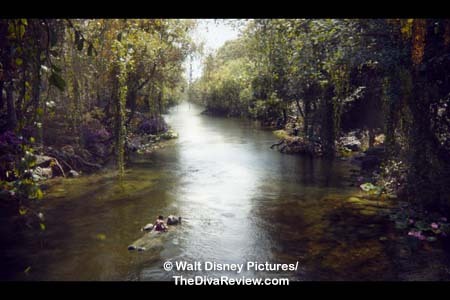 In their attempt to lighten the darker tone and also to remind us that the film owes more to Disney’s 1967 cartoon than Kipling’s original stories, some of the classic songs from that earlier film are inserted here, namely "The Bare Necessities," sung by Baloo and Mowgli, and "I Wan'na Be Like You," croaked by King Louie, but they are an ill fit and only feel obligatory and out of step against the intense background of all that precedes these scenes. It also slows the film down jarringly. (Mercifully, Johansson’s droning version of “Trust in Me” is relegated to the end credits. Why they didn’t just use Siouxsie and the Banshees’s hypnotic version and be done with it, I’ll never know.) 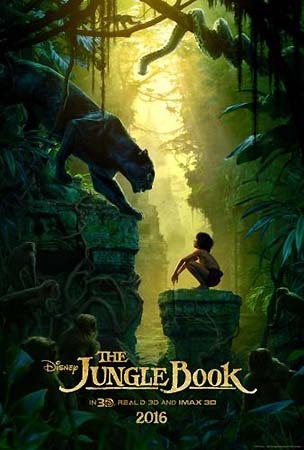 Most of these matters can be chalked up to trying to strike a balance between making a great movie that captures the wild excitement of jungle life and the intensity of the vicious Shere Khan’s threat against Mowgli, and making something that little kids wouldn’t be too freaked out by. Between the two choices, I’m glad Favreau stuck closer to the former goal. 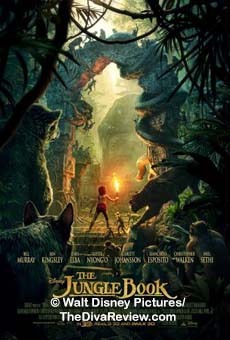 Under director Jon Favreau’s deft and judicious hand, I feel like we’ve seen a milestone both in children’s storytelling and the advancement of how seamless and integral to a film 3D visual effects can be. I’m a bit surprised Disney hasn’t pumped this movie up promotionally as much as it deserves. 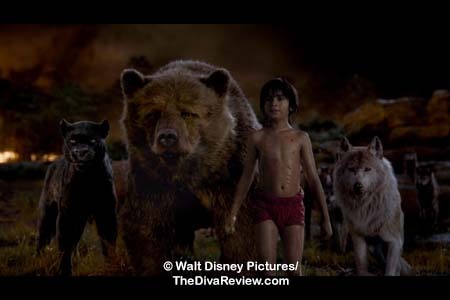 I’m as excited for the next chapter of Mowgli’s adventures as I ever was for the next Avengers or Star Wars. 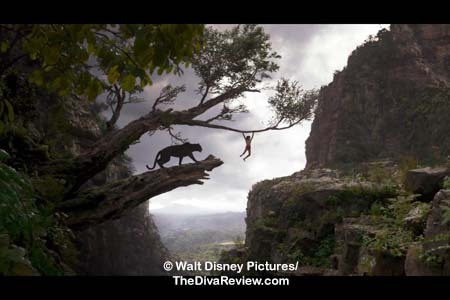 Exhilarating, heartfelt and visually stunning, The Jungle Book easily careens out in front of the pack as the year’s best movie.